Institutional funding has become increasingly important for War Child over the past five years. Institutional donors not only provide essential income to the organisation, they are also key partners in advocacy, innovation, and programme development, bringing in expertise and knowledge that complement War Child’s work. Grants from institutional donors now represent 52% of total programme funding. In 2013 War Child’s received an increasing number of grants for emergency projects from ECHO, UNHCR, UNICEF and OCHA. 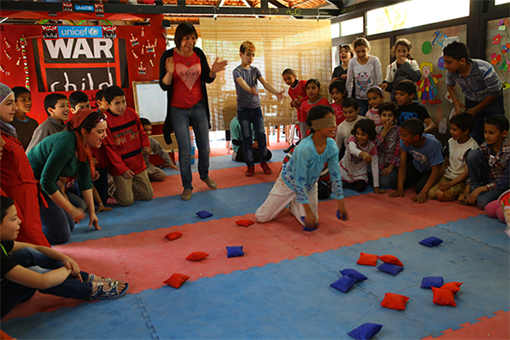 War Child’s strong relationship with the European Commission (EC) continued in 2013, with a total of ten grants from both the Humanitarian Office as well as through local in-country EC delegations running in seven countries. As this report was written, four additional grants started, with another two expected in the first half of 2014. The grants support projects focusing on, for example, enabling children to speak out on their rights, providing emergency education in fragile environments, supporting working children to go back to school, improving the protection of children from abuse, violence and neglect through improved local protection mechanisms, and enhancing children’s resilience in conflict-affected areas. In November 2013, War Child applied for the Strategic Partnership for Protracted Crises with the Ministry of Foreign Affairs. Along with seven other organisations War Child was selected to join the partnership in early 2014. The partnership will focus on the Great Lakes Region (Burundi, DR Congo and Uganda), where we will work to increase the resilience and future prospects of children and young people through improved protection, increased access to basic education and vocational training, and increased opportunities for participation, contributing to peace and stability in the region. The partnership includes a grant of € 3.75 million over three years. Since 2010, War Child has been able to reach thousands of children thanks to yearly contributions and structural support from the Dutch Postcode Lottery, the largest charity lottery in the Netherlands. The lottery’s contribution is unique because it is not only structural, but also flexible; we can determine the use of these funds ourselves, based on our expertise and the needs identified in the countries where we work. 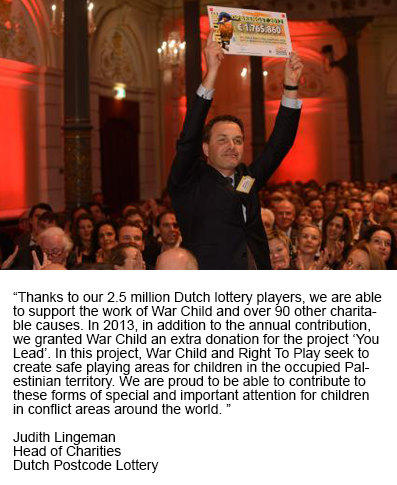 The Dutch Postcode Lottery provides War Child with funding essential to the success of our projects, for which the lottery’s continued fundraising success is crucial. Overall, 50 percent of the lottery´s proceeds are distributed to more than ninety charities in the Netherlands and abroad.